In hopes of giving you a better understanding of the philosophical foundation at Balanced Achievement, we have created a ‘Balanced Achievement 101’ series that reviews the various components that merge together to form our teaching ideology. In each article (links can be found at the bottom of this page) we outline the given topic, discuss important historical information, and examine key educational concepts that are relevant to the teachings at Balanced Achievement. In this article, we explore the religion of compassion and contentment in Buddhism 101. Currently there are around 500 million people throughout the world who associate themselves with the Buddhist religion, and the vast majority of these individuals reside within the Asian continent. Buddhism is the primary religion in countries such as Thailand, Vietnam, Laos, Cambodia, Tibet, and Sri Lanka. There are also significant amounts of Buddhists, who call more heavily populations countries home, in places such as Japan, China, and India. While Buddhism plays an important role in the cultures of these more heavily populated countries, there are other religions, or belief systems, that have a similar or greater percentage of individuals associated with them. Every teaching that is found in the Buddhist religion revolves around the life of a signal individual, Siddhartha Gautama, who became the Buddha at the age of 35. 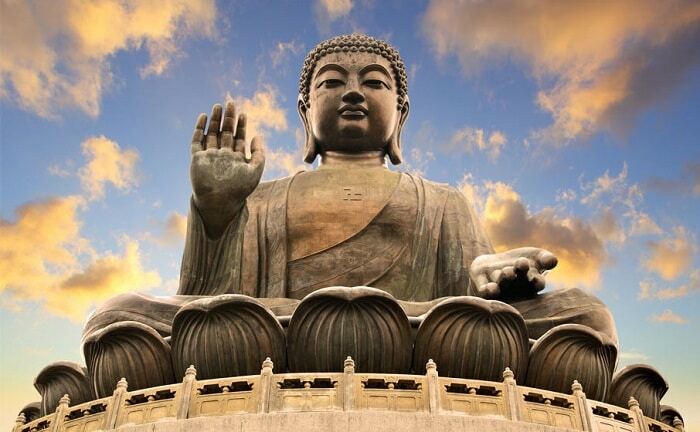 It is believed that the Buddha lived from 563 B.C.E. until 483 B.C.E. His teaching are focused largely around two key concepts, The 4 Noble Truths and The Noble 8 Fold Path, both of which revolve around ideas of human suffering and the path towards the cessation of this suffering. Today, there are 2 main schools of Buddhism, Theravada and Mahayana, which share similar doctrinal beliefs but express and teach the religion through different culturally relevant customs. Many falsely consider the Dalai Lama to be the leader of the entire Buddhist religion, however, his role as a leader is much more limited then the media attention, that he receives, would lead one to believe. The Dalai Lama is solely the leader of Tibetan Buddhism, which is a branch of the Mahayana school. Still, this should in no way limit our appreciation for the work that he has done to spread the messages of the religion. For many practicing individuals, the Dharma, or teachings of the Buddha, remain the only truly worthy guide for one to follow, although this doesn’t mean that there aren’t high ranking and revered monks, lamas, and teachers throughout the various countries where Buddhism is found. Similar to Christianity, Islam, and Hinduism, there is a single scripture that is thought of as the divine text in Buddhism, the Pali Canon (also called the Tripitaka), and both the Mahayana and Theravada teaching derive from it. One of the key distinctions between the two schools is based upon secondary scriptures. The Mahayana school also believes that hundreds of other texts, called the Sutras, are extremely important doctrines for followers of the religion, where as the Theravada school maintains the belief that the Pali Canon is the only true canonical text. Around 563 B.C.E. a young prince, Siddhartha Gautama, was born to a warrior tribe in modern day Nepal near the border of India. During the pregnancy of his mother, and after the prince’s birth, spiritual seers and sages predicted that the young boy would either become a great leader of the Shakya warrior tribe or he would become an important enlightened being, a Buddha. The father of Siddhartha, King Suddhodana, had great aspirations for his young child, viewing him as the future leader of his kingdom, and did everything in his power to keep him from becoming a spiritual seeker. Until late in his 20s, Siddhartha was kept sheltered from the outside world and not allowed to exit the palace walls where he could be exposed to experiences that would potentially alter his path. It wasn’t until the age of 29 when Siddhartha was finally able to venture outside of his sheltered palace life and it was during his first trip outside of the palace walls where he encountered four sights that changed the landscape of world religion for eternity. As Siddhartha and one of his father’s most trusted courier, Channa, left the palace walls, the duo encountered an man of old age, a man suffering from disease, a corpse, and a ascetic monk. During this short journey Siddhartha questioned Channa about each of these sights and Channa told him about the reality that we all face. We will grow old, we will get sick, and we will perish. When the pair encountered the monk and Siddhartha questioned Channa about his role in society, the prince began to wonder if there was a way out of the cycle of suffering and rebirth. After returning home, these thought vibrantly replayed in Siddhartha’s mind, and the following night he proceeded to leave his kingdom to seek a cure for the ultimate human dilemma. After 6 years of intense study and inner exploration through meditation, Siddhartha became enlightened in the city of Bodhgaya, India, underneath what is now a widely celebrated and cherished tree, the Bodhi Tree. After reaching enlightenment in Bodhgaya, the Buddha devoted the rest of his 80 year life to teaching the path that he took from suffering to enlightenment. As he moved throughout the country and his message continued to spread, the Buddha systematically took on a massive following of individuals who wanted to similarly reach the state of liberation. This is the basis for how the religion of Buddhism was formed. It is worth noting that still to this day however, the Buddha has never been considered a God, but a regular man who freed himself from the cycle of suffering through inner exploration. The Buddha’s teachings are primarily based upon ideas of human suffering and how any individual can overcome the constant struggle of trying to remain satisfied with life. While intense forms of suffering such as sickness, death, depression, anxiety, and addiction are easy to observe, it is important to look beyond these intense states. Small annoyances and frustrations also constitute the Buddhist view of suffering. It is also vital to note that while we primarily like to think about the suffering that comes from negative occurrences, our attachments to and cravings for positive things, people, events, and circumstances also are a basis for suffering. Because of the impermanent nature of all things, when we become attached to pleasurable experiences that are constantly changing we undeniably stay locked in the cycle of suffering. 1.) Humans continually suffer throughout their lives. 2.) There is a cause of this suffering. Our ignorance about the reality of existence causes us to crave pleasurable experiences and things, while also trying to push away negative experiences and objects. 3.) There is an end to the suffering we experience, which can happen at death or by reaching a state of enlightenment. 4.) There is a path we can take to end our suffering in this existence. This path is what is known as The Noble 8 Fold Path. Enlightenment: The ultimate goal or destination for Buddhist practitioners is the state of enlightenment. The term enlightenment is frequently interchanged with other similar words such as Nirvana, Awakening, and Liberation. While a completely accurate definition of this state is hard to describe, there are a number of key ideas, based upon the Buddha’s teachings, that we can look at in hopes of bringing the state to life. If one reached this state they would have completely freed themselves from their attachments (cravings and aversions) to both positive and negative events, circumstances, people, and emotions. The conditioning they had accumulated over this lifetime, and past lives, would be removed, and they would live whole-heatedly in the present moment while making decisions that bring peace for all. The ignorance that keeps them stuck in the cycle of suffering would also be removed. They would be unaffected by outer circumstances, because they have realized that they are perfectly whole and complete already, but still focus their attention on helping others reach the state of ultimate liberation. They would live in a state of purity and bliss for the remainder of their time on this earth. Other Important Teachings: The 3 Jewels, The 5 Precepts, The Wheel of Life, & The 3 Marks of Existence (Some of the most important, but not limited to these). Meditation: Three of the 8 steps that are discussed in the Noble Eight Fold Path are directly related to Meditation. The Buddha obsessively meditated to gain insight into how his mind works and eventually reached Nirvana, while practicing meditation, as he sat underneath the Bodhi Tree. While enlightenment may not be your primary goal, you can undoubtedly use meditation to enhance your understanding of reality, overcome problems, and relieve yourself of negative feelings such as regret, self-doubt, self-criticism, depression, and anxiety. If you would like to learn more about meditation, you may want read our article, Meditating with Mindfulness and Concentration, which discusses the two basic components of meditation. Compassion and Contentment: Two of the personal qualities that are consistently discussed throughout the Buddhist doctrine are compassion and contentment. In order to live with higher levels of fulfillment, we have to focus on developing compassion towards others and contentment with ourselves and our lives. Being compassionate towards other instantaneously helps us form a connection with others, which is one of the things we all desire at the deepest level of our beings. Compassion has also been scientifically proven to increase the levels of happiness that individuals experience. When we find contentment with our situation, past mistakes, physical features, and life in general, we are able to relax and live in the present moment, which is the only place that we can experience true and genuine happiness. We hope that you have enjoyed this installment of Balanced Achievement 101 and we look forward to seeing you tomorrow when we explore the world of Scientific Psychology.